TechnoAlpin’s range is expanding with the new T40! The T40 is a perfect combination of tried and trusted technology and trend-setting innovation. TechnoAlpin has also equipped its latest product with wear-resistant Quadrijet nozzles and ceramic inserts. The nozzle support, however, has been upgraded and is now made of cast aluminum. This enables improved water throughput and facilitates removal of heating elements. As with all TechnoAlpin snow generators since 1999, the T40 also features an oil-free compressor, which means that the machine is low-maintenance and environmentally-friendly. The water filter has been upgraded and is now manufactured from nickel chromium steel. The Wedge Wire filter ensures maximum strength and easy cleaning. The new control panel is extremely user-friendly with a color display and LEDs. The T40 can also be operated using the exceptionally easy to use, optional Bluetooth wireless remote control. Access to the swivel lever, height adjustment facility and valve block with filter on the same side of the machine enhances user-friendliness, as do the lightweight PE covers which can be removed quickly and easily. Although not obvious at first sight but all the more significant, the dimensions and weight have been reduced. With a total height of 2.45 m, width of 2.2 m and length of 2.6 m, the T40 automatic mobile is ultra compact. The machine’s weight has been reduced to 600 kg, which also facilitates easy handling and means that the machine can be transported by air. The T40 is available as an arm-mounted device with standard lengths of 10 m and 6 m, and also as a 1.6 m-tall tower-mounted version. It can be converted into a light, mobile lift-mounted machine too. The front section of the two-part carriage which has been especially designed for the T40, can be easily dismounted and the machine can be directly docked and fixed onto the lift carriage. The jacks and rear part of the carriage can then be removed. 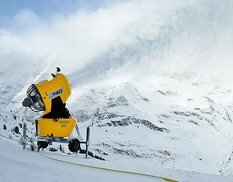 The snow gun can be connected, moved into operating position and the complete carriage simply taken away with the groomer. TechnoAlpin was founded 20 years ago. Ever since, the company has been a leading developer of snow-making technology, producing fan guns and snow lances. The full-range supplier of snow-making systems now helps 936 customers in 41 countries guarantee snow reliability. Over 200 employees and 25 subsidiaries throughout the world ensure excellent customer proximity and a high-quality service.